This article was written By Guest Contributor on 15 Sep 2010, and is filed under Reviews. 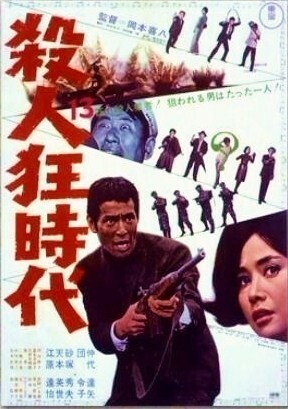 The Age of Assassins is an extremely fun anti-war genre satire in the vein of Nikudan (aka Human Bullet, 1968) , but distinct from the likes of the apocalyptic Strangelove, The Manchurian Candidate (1962), the corporate goofs in Giants & Toys (1968), or The Black Test Car (1962). Okamoto and writer Ei Ogawa riff on the cliches of then-popular spy films, with their genre mastery evident throughout. Nakadai plays an unlikely anti-hero, quite the opposite of the usual stoic, cool customer he frequently plays. Eisei Amamoto is his mad scientist nemesis, in a terrifically theatrical turn. He has engineered an asylum full of sociopathic programmed assassins, in a fun nod to Manchurian Candidate. To impress a neo-Nazi seeking to resurrect the Reich, he demonstrates his killers’ effectiveness by plucking three names at random from the phone book for extermination. Unfortunately for the baddies, the last pick is an eccentric otaku doc of criminal psych played hilariously by the great Tatsuya Nakadai. His oblivious vulnerability might seem more well placed in an early Woody Allen film, as his itchy feet and silly pen gadget take on an army of trained, homicidal maniacs. Reiko Dan is quite cute and funny as the free-spirited love interest, seemingly far too hip and smart for Nakadai’s shy advances. And Hideo Sunazuka amusingly plays the sidekick Otomo Bill, master of his namesake vehicle. This is fun, anti-imperialist genre spoofery not unlike that of Seijun Suzuki, but less angry or genre-defiant and more of a fun, loosely structured romp like Okamoto’s later Akage/Red Lion. You might especially like this if you are tired of Okamoto’s darker, more serious critiques – Sword of Doom (1966), Kiru! (aka Kill!, 1968), or Samurai Assassin (1965). Or, especially if you’ve been watching too many of the ’60s spy/conspiracy flicks that it goofs on. © 2010 VCinema. All Rights Reserved.